the Kingdom on Saturday announced plans to establish 50 seismic stations within the next three years to monitor earthquakes and tremors. The stations, with strong motion-detection instruments, will reduce damage to life and property, and enable planning for emergencies caused by earthquake activity. There are certain regions in the Kingdom that are prone to earthquakes, said Hani Zahran, director general of the National Center for Earthquakes and Volcanoes. Saudi Arabia has experienced considerable earthquakes in the past, he added. “Both historical and modern seismicity records, as well as geological data, suggest that the area around the city of Tabuk and stretching to the Gulf of Aqaba should be considered a region with a relatively high seismic hazard threat,” Zahran told. The Saudi Geological Survey’s (SGS) existing seismic network contains 235 stations to monitor seismic activity on the Arabian Peninsula. Zahran said the SGS network includes 76 stations equipped with motion-detection instruments for sensing ground vibrations during relatively large earthquakes. A seismograph is an instrument that measures ground vibrations and activities like earthquakes and volcanoes. 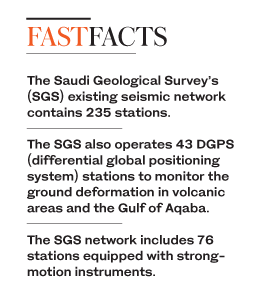 Zahran said the SGS also operates 43 DGPS (differential global positioning system) stations to monitor the ground deformation in volcanic areas and the Gulf of Aqaba. “The Arabian plate is one of the youngest of the Earth’s lithospheric plates. It is surrounded by relatively active tectonic zones that are characterized by relatively high seismic activity,” he said. He said modern seismometer stations continuously record the registered ground movements and store the data. “The National Center for Earthquakes and Volcanoes, an affiliate of the SGS, operates the local seismograph network besides processing and analyzing all recorded earthquakes within Saudi Arabia. It also educates the public regarding earthquake hazards,” he said.